At a quick glance, the most noticeable aspect of the Japan’s women’s hockey team that has been named for the PyeongChang Winter Games is that the roster bears players with substantial professional experience – an NWHL alum in net, along with a few CWHL players. This will bode well for the Japanese who qualified for the 2018 Olympics and find themselves in Group B alongside Sweden, Switzerland and South Korea. The other aspect that jumps out is that the players comprising Japan’s roster all have plenty of experience in international play. 20 of the 23 players that will be in PyeongChang were members of the team that earned them the qualification in the first place. They are back together again with hopes of an Olympic medal. 15 of these same players saw action at the 2014 Sochi Winter Games in Russia, so there is no question that they are well-versed with one another and form a capable squad. Known affectionately as “Smile Japan” for their upbeat personalities and their tendency to show radiant smiles, the Japanese are a popular underdog to cheer for at these Olympics. You have to like what Japan will bring to the table. One of the dishes they are most inclined to serve in international play is their steadiness. Japan rarely, if ever, wavers no matter what the scoreboard might say. They play efficiently and with a calmness on the ice. It is never a good idea to underestimate teams of that nature. Nana Fujimoto (Vortex Sapporo), Mai Kondo (Mikage Gretz), Akane Konishi (Seibu Princess Rabbits). Nana Fujimoto returns to Japan’s net for her second Winter Olympics. In Sochi, she was the starter and appeared in all five of Japan’s tournament games. In the process, she turned out an .886 save percentage and 3.31 goals against average. Separately, Fujimoto had an outstanding first (and thus far only) professional season in North America. During the 2015-16 NWHL season, she was an original member of the New York (now Metropolitan) Riveters. Fujimoto’s numbers ranked her third best in the fledgling league with a .911 SV% and a 3.28 GAA in 13 games. She was one of only four NWHL goalies to play 10 or more games that first season. Had she remained in the league, Fujimoto would have continued to be an elite NWHL starter. 22-year-old Akane Konishi was Fujimoto’s backup in Sochi. She made a very brief appearance in Japan’s final game of that Olympics in a 3-2 loss to the Germans. Playing in a portion of the second period and then all of the third, Konishi stopped all nine shots that she faced. No longer a teenager, she will likely serve as Fujimoto’s backup for another go-round. Konishi is a sturdy 5-foot-5 and over 140 pounds. 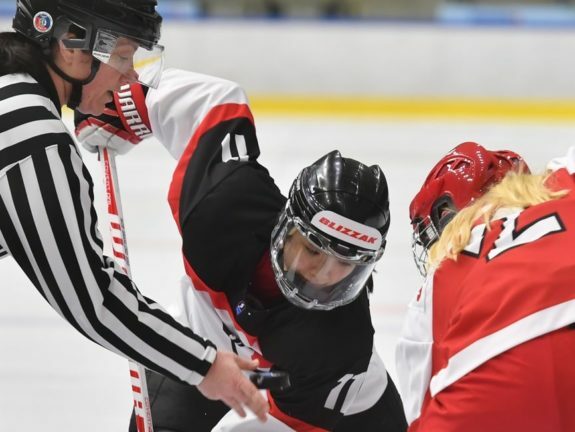 She has performed well in the limited amount of action she has seen in IIHF Women’s Worlds and U18 tournaments as well. 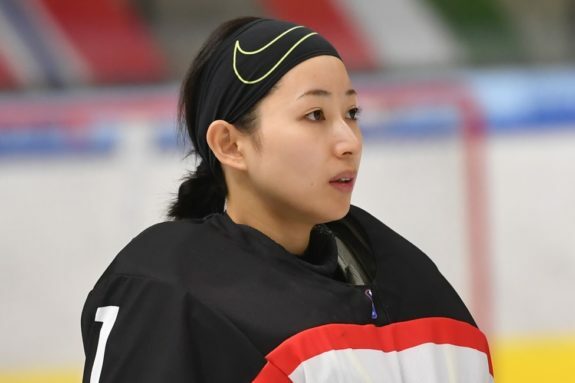 Mai Kondo is the third option in net for Japan, but is pretty much guaranteed to be the third-stringer throughout the games. The 25-year-old goalie is the same height at Konishi but is shy of her size by 30 pounds. The most we have seen Kondo perform internationally was during the 2009 Women’s Division 1 tournament. There she appeared in two games and had a remarkable .977 SV% and 0.50 GAA. Japan won the tournament and Kondo made 19 saves in a 5-1 win over Slovakia, and shutout France 2-0 on 23 stops. Fujimoto will be the starter once more and is the most pivotal player for Japan’s success. Mika Hori (Toyota Cygnus), Akane Hosoyamada (DK Peregrine), Shiori Koike (DK Peregrine), Aoi Shiga (Obihiro Ladies), Sena Suzuki (Seibu Princess Rabbits), Aina Takeuchi (Daishin), Ayaka Toko (Seibu Princess Rabbits). Aina Takeuchi is a CWHL Clarkson Cup champion – she helped the Calgary Inferno win the trophy during the 2015-16 season. That was an excellent season for Takeuchi in general. She played in a career-high 20 games, scored a goal and added three assists. Furthermore, Takeuchi would be third among Calgary defenders in plus/minus with a plus-eight. Come playoff time as the Inferno won the Cup, she played in all three of the club’s playoff games and picked up an assist. Takeuchi became one of the first two Japanese-born players to win the Clarkson Cup. The first non-North American player to play in a CWHL All-Star Game is Japanese defender Sena Suzuki. She will be joining Takeuchi in PyeongChang as CWHL alums. The 26-year-old Suzuki is very sound defensively but can move the puck up ice very well too. During her CWHL career, she recorded a goal and five assists in 28 games for the Toronto Furies. These will be Suzuki’s second Winter Olympics. In Sochi, she picked up a lone assist while playing in four of Japan’s five games. Her plus-three in 2014 placed her for in a three-way tie for best plus/minus on Japan’s roster. Clapper City. Population: Sena Suzuki. Akane Hosoyamada was born in Canada but has represented Japan in international play. For five seasons she played NCAA hockey at Syracuse University and served as a topnotch defender in each of her years with the Orange. In 151 career NCAA games, Hosoyamada compiled 10 goals and 51 assists for 61 points. She also briefly played for the Calgary Inferno during the 2016-17 CWHL season, and picked up a pair of assists in five career games. Hosoyamada is arguably Japan’s best defender in PyeongChang. She will need to be at her very best and when it comes to getting pucks in deep in order for this team to garner some victories. Yurie Adachi (Seibu Princess Rabbits), Moeko Fujimoto (Toyota Cygnus), Tomomi Iwahara (Seibu Princess Rabbits), Hanae Kubo (Seibu Princess Rabbits), Ami Nakamura (Seibu Princess Rabbits), Shoko Ono (Mikage Gretz), Chiho Osawa (DK Peregrine), Miho Shishiuchi (Toyota Cygnus), Suzuka Taka (DK Peregrine), Naho Terashima (Daishin), Haruka Toko (Seibu Princess Rabbits), Rui Ukita (Daishin), Haruna Yoneyama (DK Peregrine). The diminutive Yurie Adachi will be playing in her second Olympics as well. At 32 years old, Adachi is only 5-foot-1 and 112 pounds. Still, she brings an excellent blend of both experience and skill. During the 2016 IIHF Women’s World Championships in Kamloops, British Columbia, Adachi tied for Japan’s team lead in scoring with three points (one goal, two assists) in five games. 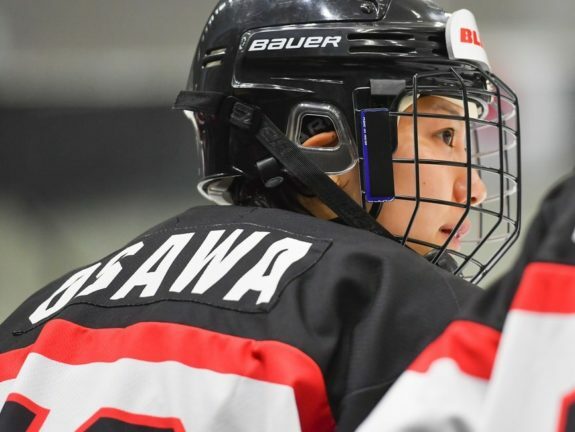 Way back in 2007, she almost singlehandedly won the IIHF Women’s D1 tournament for Japan as she led the whole tournament in scoring with six goals and four assists for 10 points in just five games. Japan went undefeated at that particular tourney. Rui Ukita gives Japan some good size up front. Standing at 5-foot-6 but close to 160 pounds, Ukita has a fair amount of strength to her game too. At IIHF U18 tournaments, she routinely put the puck in the back of the net. Ukita is only 21 years old, so it is not like those times were that far off. In 15 games of U18 tourneys, she scored 13 goals and was a plus-12. In Sochi, Ukita had just one assist in five games and zero goals. Obviously, that can be attributed to her just being 17 years old at the time. This time around though in PyeongChang, Japan needs her to find the back of the net. No exceptions. Japan’s team captain for the good majority of international tournaments for the past six years or so has been Chiho Osawa. This hardworking forward will actually turn 26 years old on the second day of the PyeongChang Games. Back in Sochi, Osawa tied for the team lead in scoring for Japan with a goal and two assists in five games. In various IIHF international tournaments, she is usually good for three to five points each time. Osawa will be Japan’s “Ms. Steady” when it comes to contributing offensively. Do the Japanese have a legitimate shot at a medal in South Korea? It is hard to say. One would be inclined to say “no”, but anything can happen. Separately, this is a talented hockey team regardless. They may not be the most talented in PyeongChang, but they have talent most assuredly. Fujimoto is the most important piece of their success. The best part about that is that she is used to handling that type of a load and always does so admirably well. Barring a catastrophe, Fujimoto is bound to get all of the starts for Japan’s goal crease. As for the skaters, it is that steadying aspect. The Japanese seem to function as one unit instead of individuals better than most teams that will be skating in PyeongChang. That is always a dangerous circumstance for opposing teams when one team is clicking like clockwork. Osawa, Ukita, Hosoyamada, etc. can all generate offense, and that will need to be the case for this team to have success. Hanae Kubo is the elder stateswoman on the team – she just turned 35 back in December. In the first variation of the NWHL, Kubo played for the Oakville Ice and scored 15 goals and 19 assists in 36 games. In the Olympic qualifying games for PyeongChang, she was awesome with five goals and an assist in three games. Perhaps the aged guard can get the offensive wheels rolling for this team once the games get underway.